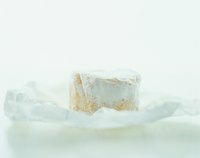 Brie is a French cheese with a long shelf life. It's a popular appetizer, served with bread or fruit. This cheese can be purchased fresh; however aged brie cheese becomes stronger and richer in flavor, creating a more flavorful type of cheese. It can be expensive, making it important to store the cheese properly so none is wasted. The storage requirements are very simple, and when frozen, can last up to three months. Slice the cheese into chunks that weigh 1/2 lb. or less. This cheese is stored best when cut and wrapped in small portions. Wrap the chunks in wax paper, then wrap in plastic wrap to create an air-tight seal. Place in the refrigerator for up to one week. Freeze cheese for up to three months. When cheese is frozen, it is best used for cooking purposes. Wrap the cheese in aluminum foil, then in a plastic freezer bag with an air tight seal. Brie cheese comes with a grayish mold, which is normal. If any new mold forms on the cheese that is not a natural part of the cheese, throw away all of the cheese. With its springy rind, soft interior and characteristic wedge shape, Brie cheese can be a slicing challenge.